What Was Milwaukee's Key Role In Typewriter History? The Olivetti Studio 44 that resides next to some friendly bobbleheads in Mitch Teich's office. 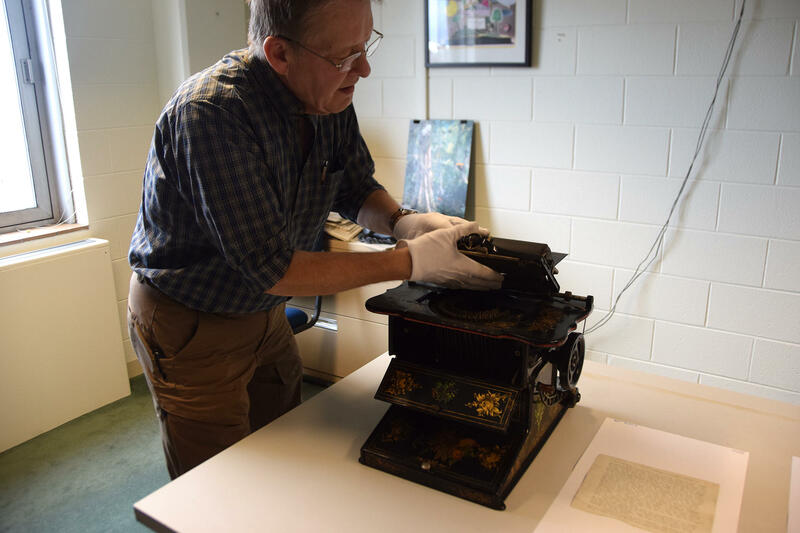 Lake Effect's Mitch Teich reports on Milwaukee's key role in typewriter history. Can you provide more context behind the typewriter being invented in Milwaukee? Tim doesn’t know it but an Olivetti Studio 44 resides in my office. That was the portable typewriter favored by Tennessee Williams. But I digress. A historical marker at the corner of Fourth and State Streets in Milwaukee denotes a nearby spot as the birthplace of the typewriter. 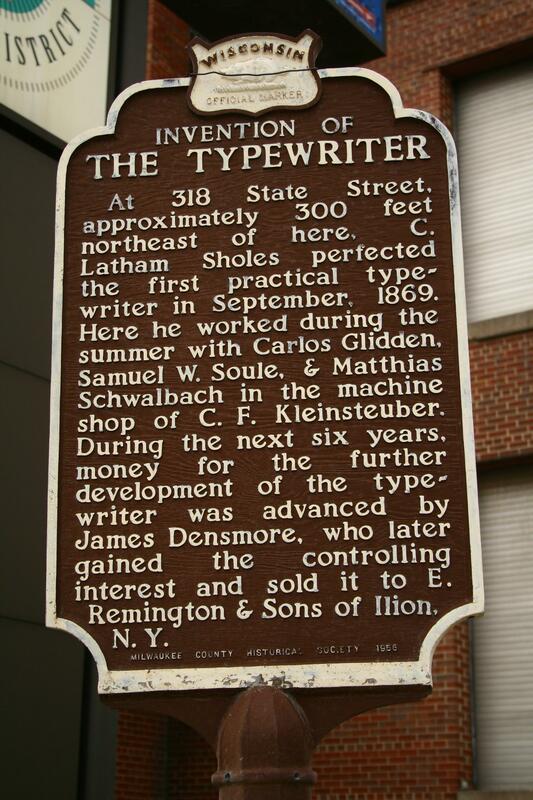 Tim and others might already know that there’s a historical marker at the corner of Fourth and State Streets that denotes a nearby spot as the birthplace of the typewriter. Today, there aren’t very many typewriters at that spot since it’s now the wreckage of the Bradley Center. But just a half-mile away, at the Milwaukee Public Museum, you’ll find 947 of them. Al Muchka knows a lot about typewriters — he’s the curator of American history at the Milwaukee Public Museum. There are two in particular he brought out to help describe Milwaukee’s key role in typewriter history. One of them looks more like a piano keyboard. It was the invention of Christopher Latham Sholes, a newspaper publisher who had been living in what is now Kenosha. It was the mid-19th century, but after studying some other machines, Christopher got some of his fellow tinkerers together at a machine shop on State Street in a very 21st century way. 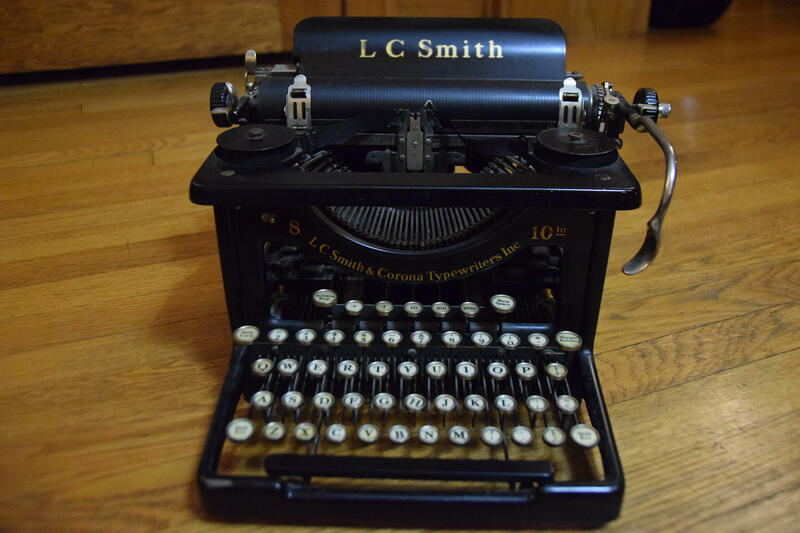 Christopher Latham Sholes's early model typewriter, which included 38 keys on a keyboard modeled after a piano. “They got together and it was kind of like — these days, think of it as a business or invention incubator, you see them all over town — these little places where people get together and they start a business and they really kind of get going with it. And it’s idea after idea after idea,” he explains. 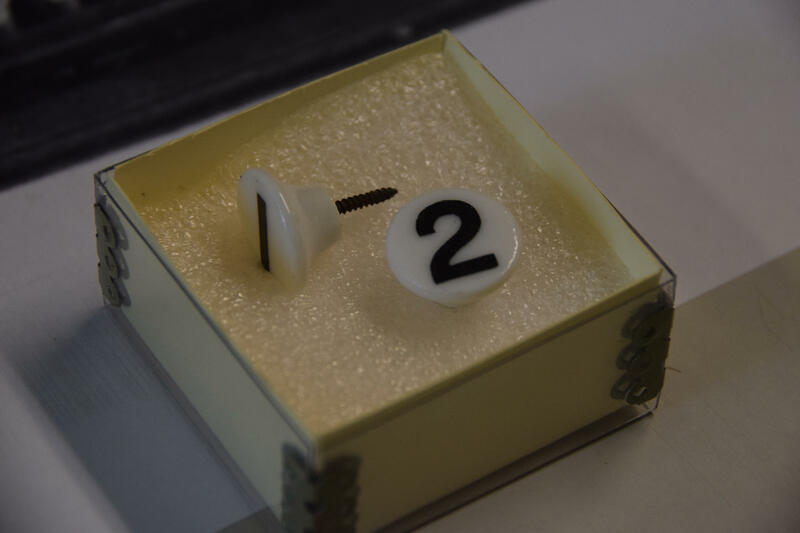 Ceramic keys, made in Milwaukee, for an early typewriter. The idea that seems to hold promise is a piano-style keyboard with 38 keys. It was patented in 1868, at which point they immediately set out to improve it, much to the relief of future typists of limited musical talent. 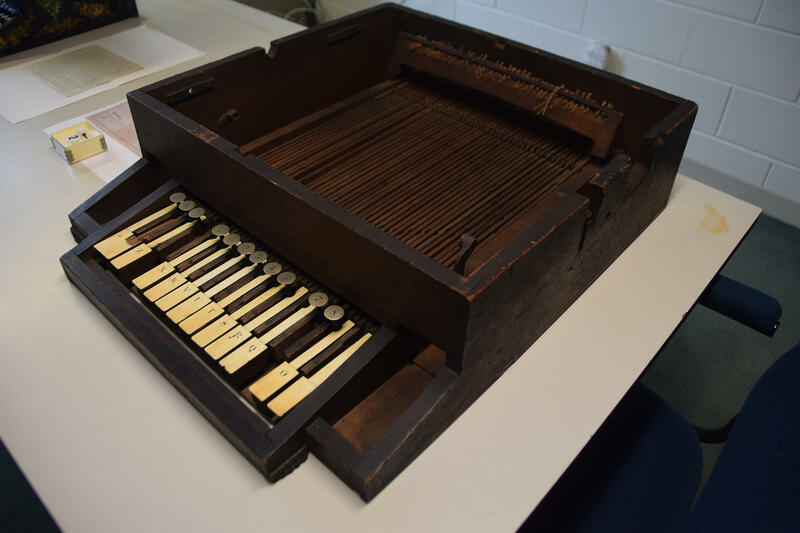 “They started looking further into a lot of this stuff and got the idea of using a telegraph key style keypad to actuate, instead of the piano keys. You got greater action, you were able to have a greater diversity of letters and numbers and characters,” Al says. But Al says Christopher was an idea man, a dreamer. To scale up production of his new invention, he really needed what a lot of inventors need: a business person. 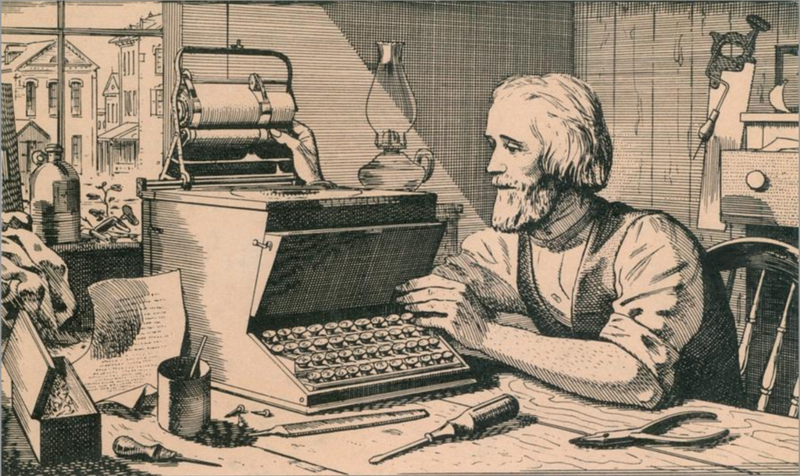 Christopher Latham Sholes at his typewriter, circa the 1870s. “He needed somebody with business acumen and he needed some more money. After many, many inquiries were sent by Sholes and his compatriots around the country looking for investors, Densmore answered. And Densmore put up every penny he had,” says Al. That’s Pennsylvanian James Densmore, a former newspaper associate of Christopher’s. And “every penny” amounted to around $700. But with the money Christopher wanted came something that he was less excited about: advice. Within a couple of generations, typewriters evolved to lose a little of their ornamentation. This is an L.C. Smith Model 8-10 from the late 1920s. “He invested, gave Sholes the money but then immediately started making suggestions to make it better. And Sholes responded well the first few times. After that, he started getting a little upset with the suggestions,” says Al. Turns out, a couple of those suggestions were pretty useful. Like, say, the arrangement of the keyboard. After some prompting, Christopher developed the QWERTY keyboard — the keyboard we’re all familiar with. But where did that come from? By the second half of the 20th Century, typewriters took on a more modern, utilitarian look. 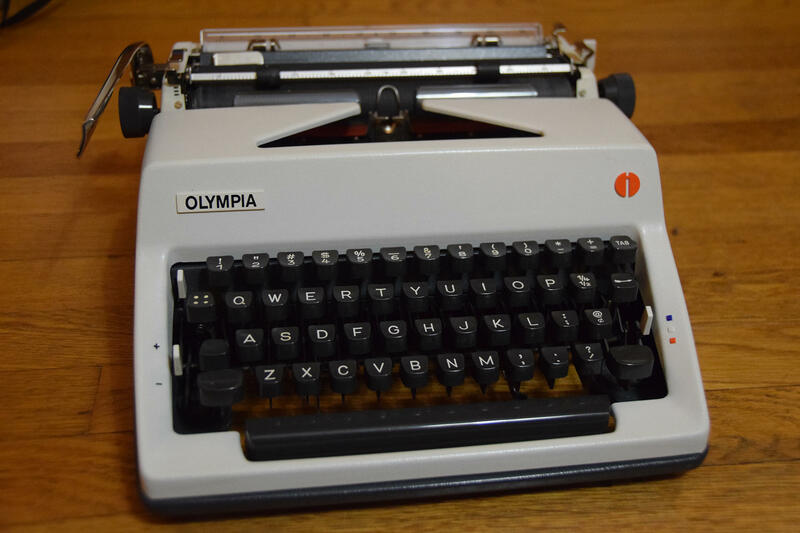 This is an Olympia SM-9 made in West Germany in 1971. “That’s still a little mysterious,” says Richard Polt, a philosophy professor at Xavier University and author of the book The Typewriter Revolution: A Typist's Companion for the 21st Century. Richard owns about 300 typewriters, by the way, including an original Sholes and Glidden. But again, I digress. He says there are different theories about the origins of QWERTY, but there’s one standard theory. “To me, it looks like [Christopher] began with an alphabetical keyboard. And you can still see that in the sequence "D F G H J K L," [on the keyboard] but some of the type bars that were swinging up to make the impression were clashing with each other, so he apparently tried to separate commonly used pairs of type bars — for example, T H — so that they wouldn't be too close to each other and wouldn't get stuck,” says Richard. Al Muchka carefully shows a beautifully ornamented Sholes and Glidden typewriter, which was made by Remington Arms. The other development James Densmore pushes is to sell him more stake in the company. That way he can pursue new financing, which he does in what you might call rapid-fire fashion, signing on the Remington Arms factory. “They had experience building guns, of course, but then after the Civil War, they needed new products. They've been making things like sewing machines, and so they decided to take a chance and build this thing called the typewriter,” says Richard. Have a question you'd like WUWM to answer? Submit your query below. Is Lovers Lane Really For Lovers? Bubbler Talk — our series that answers your questions about Milwaukee and the region — gets a lot of questions about street numbering and street names. Not too long ago, Mike Zabel submitted a question about Lovers Lane Road on Milwaukee’s far northwest side. I was wondering why the north part of Highway 100 is called Lovers Lane? Have you ever had a question that just won't go away? Milwaukee-native Ross Kuesel has been dazzled by a Milwaukee home's looming presence his whole life. So, he reached out to Bubbler Talk — our series that answers your questions about Milwaukee and the region. "What's the story behind the house built into the bluff next to the Villa Terrace Art Museum? From Lincoln Memorial Drive it looks 10 stories tall!" When did Milwaukee change from wards to districts? And why? If you do much walking through Milwaukee neighborhoods, say in the Historic Third Ward or Bay View, you’ve probably stumbled across vibrant schools of fish painted on the sidewalks. They're koi, the large decorative fish some people keep in outdoor ponds. I spotted a few of the paintings on the East Side, where several clusters of koi are depicted in orange, black and white patterns.